I am seeing birds everywhere. I don’t think it is because I just finished reading Bird by Bird by Anne Lamott, because as much as the title and the story she tells has struck a chord with me, the book isn’t really about birds. It’s about writing and about life and about noticing the amazing details during a day. For me, it’s the details that are making me very curious about more than a few things. It happens to be birds right now. 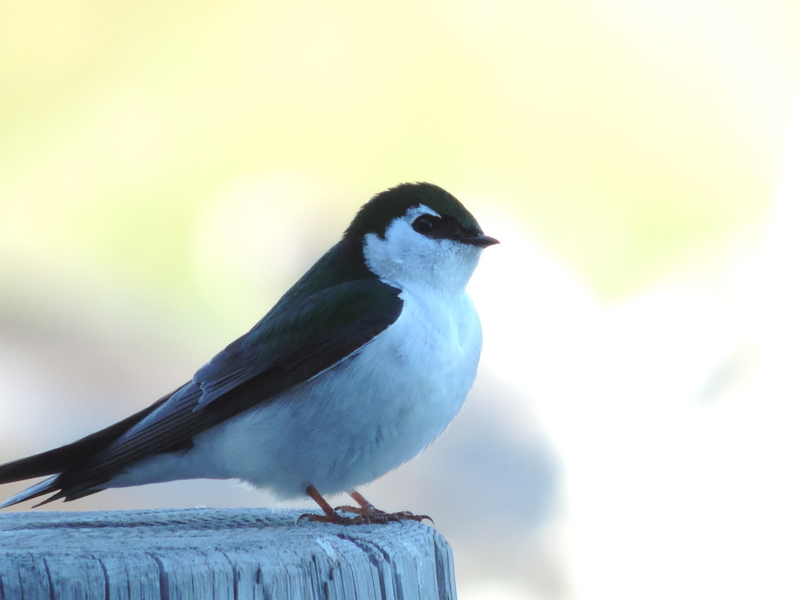 The Violet-Green Swallows are swooping around and doing their crazy air acrobatics. I sit on the porch and watch them circle around and shoot straight up the hole above our head. They have a brilliant sense of timing as they have to pull their wings in to clear the hole. They are so fast, I can’t even tell how they make their exit. I’m guessing they have already completed this year’s nest and if we just move the chairs and table out from under there, we might avoid most of the inevitable mess. 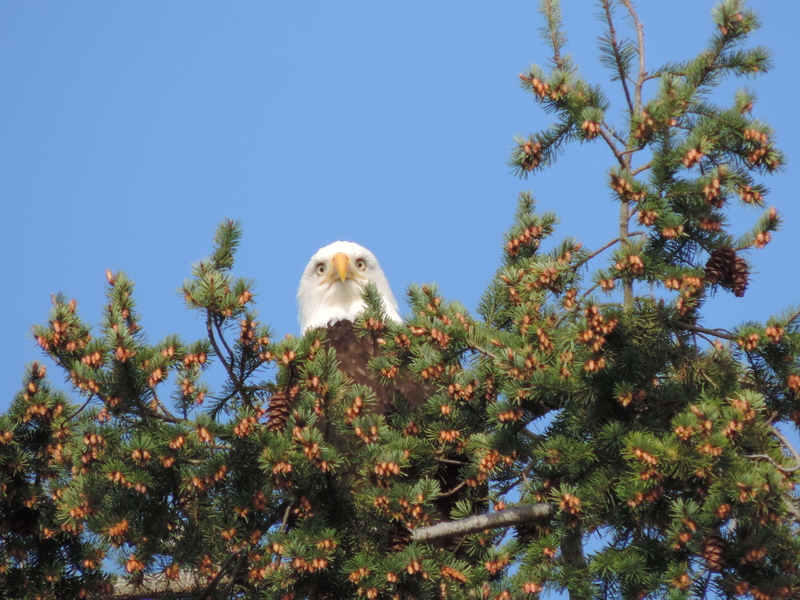 At least once or twice a day, I tend to check in on the bald eagles that have a nest going over on Battleship Island. We set up a spotting scope and are watching the progress of the two eaglets in there. I’ve seen Mr. Smith bring home dinner and watched Mrs. Smith pluck the feathers off what I am guessing was a seagull. Thing 1 and Thing 2 (they are a little homely at this young age) were very attentive to that whole process. Spying on the eagle family, I was able to watch another weird moment. I know this seems a bit gross, but I saw each of the eaglets aim and shoot their poo over the edge of the nest. Not that I really thought about it before but it does keep things clean up there. Who knew? We also spotted an older juvenile eagle in the nest with the two youngsters. I don’t know if he was from last year’s brood or not but it looked like he was helping feed the eaglets. Babysitting? Moving back in with the parents? I’ve been keeping my eye on the birds that have joined me in my garden. We’ve been having a long stretch of sunny days and things are popping up and taking off like crazy. 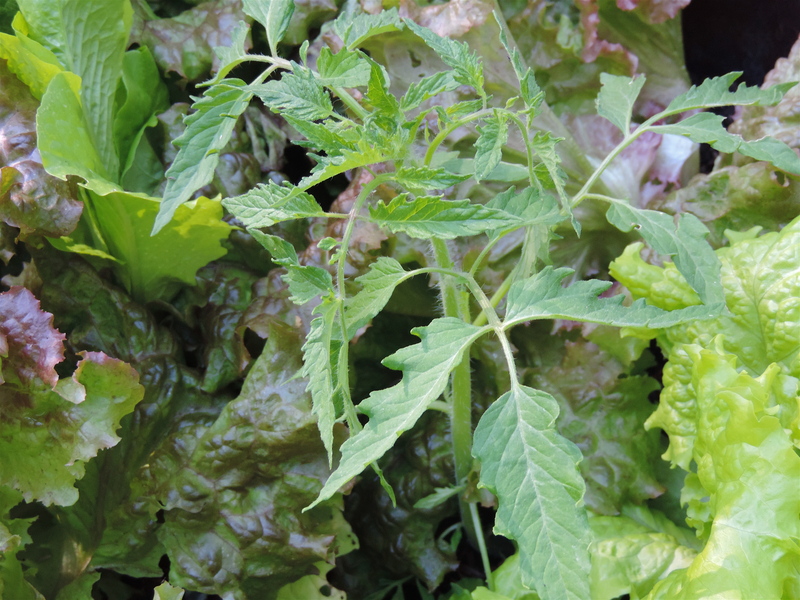 I was surprised to find tomato starts in every planter box last week and I realized that birds have helped me sow last year’s seeds everywhere. And to think I was so careful about who got to sit next to who and if they should share their soil. Now I have a tomato plant next to every darn thing I planted. I am curious to see if these birds have any garden design skills or if they just planted a convenient buffet. Your photo of Mr Smith (or is it Mrs) is so dignified. And learning how they keep their nest free of poo, made me proud to be an American 😉 Lovely post as always .